We would like to contribute our share for you to experience the joy of cooking day after day. That is exactly the reason why we exclusively offer products that rank among the best of their kind. But it is not solely quality that makes engel what it stands for. It is also our thinking in cross-generation terms, our long-term experience in the field of out-of-home products and our claim, to optimally meet the individual requirements of our customers. Our solutions and innovations for kitchen professionals! 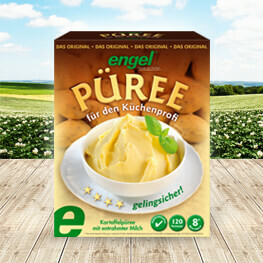 When it comes to quality puree, engel is clearly the first choice. 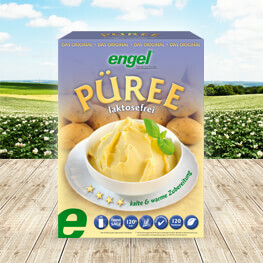 Our potato granulate for purees distinguishes itself by its extremely high water absorption, its strong cohesion, its long Bain-Marie-stability and by its creamy consistency from the first serving to the last. It ads a full-bodied flavor to croquettes, gnocchi, muffins, soups or stuffing, hence providing them with home-made like taste. 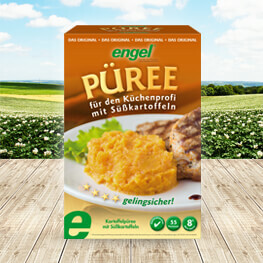 Because engel is consistently striving at achieving more, we are the premium producer of the incomparable premium instant puree: 8 hour of Bain-Marie-stability, a perfect consistency-color-taste combination, the promise for sure success in even the largest cooking pot, gradable consistency through admixture of more or less boiling water and / or of products directly into the previously prepared puree. And not to forget “OdZ”. 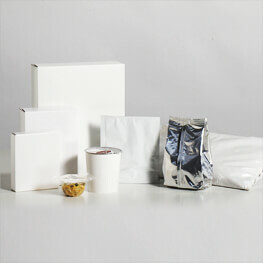 Simply ideal for the many scopes of application in gastronomy, catering and industrial kitchens! 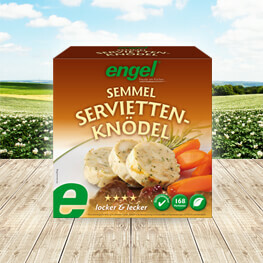 Because the products used in catering for hospitals, retirement homes and in the various industrial kitchens today not only have to be functional but also have to be tasty, the solution here being: engel! Warm preparation, cold preparation, without allergenic additives or with whole milk, without salt or refined with the finest herbs, for Bain-Marie or for Cook & Chill, for storage for a few hours or for storage of the portioned product up to 5 days in cold storage, organic or traditional in halal or in kosher quality: No matter what requirements you have, we provide the kitchen-specific solutions. 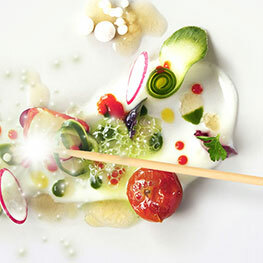 Because eating should be fun, engel again ad again offers new menu highlights for kitchen professionals. Discover our creamy sweet potato puree, our colorful blue puree with fleur de sel, our delicious truffles – or porcino purees: simply tasty! Or how about our mixture of potato – chickpeas, -lentils, -peas, -carrots…1 product, 4 applications: puree, soup, gravy, vegetarian burgers. But engel is even more: couscous or quinoa mixtures (including vegetables and spices!) for cold and warm preparation in gastronomy containers, gluten free mixtures for vegetarian burgers and falafel, soups, sauces, roux for instant-smooth light and dark gravies. As every chef sometimes needs a little support for day-to-day recipes, engel offers a large variety of base mixtures: potato dumplings and bread dumplings, loose or boil-in-the-bag packing, croquette mixtures, potato pancake, fried potatoes, potato gratin… which may serve as plain ready-to-use-mix or as basis for any individual refinement by a chef. engel – just as I want it! Only the very best for your brand: engel! We are market leaders in the production of instant potato products for the private label. Just like your brand is a unique one, we ensure that also every formulation is one of a kind. This is how customer service is performed at engel and this is how market differentiation works for you! engel has a great flexibility in developing and producing according to your wishes and ideas thus guaranteeing highest product and process quality. Our product range comprises potato products, side dishes, soups and sauces: for you we create every dry mix for your individual taste and at the convenience level you desire. Just tell us your wishes, and we will work a little magic!